Hackness Martello Tower and Battery are part of the extensive military remains on the island of Hoy. The tower and battery were built in the early 19th century to provide defence for British convoys at the height of the Napoleonic War. Barrack room furniture and other military memorabilia give an idea of life at the barracks. 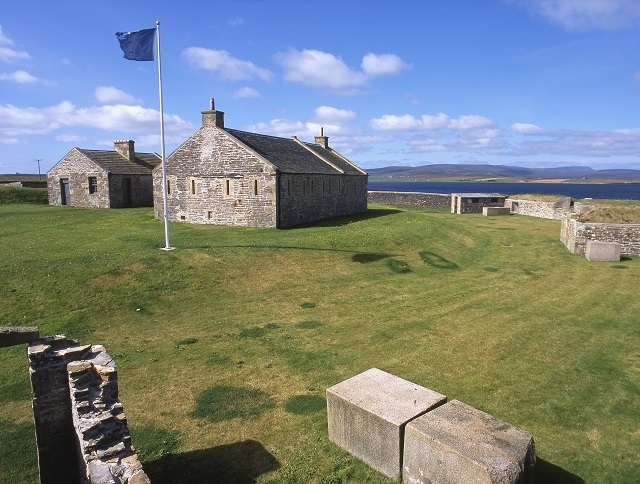 Stand on the tower and take in the view towards Scapa Flow. Hackness Battery and Martello Tower were built in 1813–14, at the height of the Napoleonic War. French and American warships were wreaking havoc on British and Scandinavian merchant shipping going ‘north about’ through the Pentland Firth or round Orkney. Longhope Sound provided a safe anchorage. The battery at Hackness was built first, followed by two Martello towers – Hackness, just 200m from the battery, and Crockness on the north side of the Sound (the latter is in private ownership). There is no record of enemy action prior to hostilities ending in 1815. In 1866, with another French invasion threatening, the battery and towers were upgraded. New guns replaced the outdated pieces, the barrack accommodation was improved, and other structures built. But even these precautions proved unnecessary. By 1883 just two artillerymen were on duty. 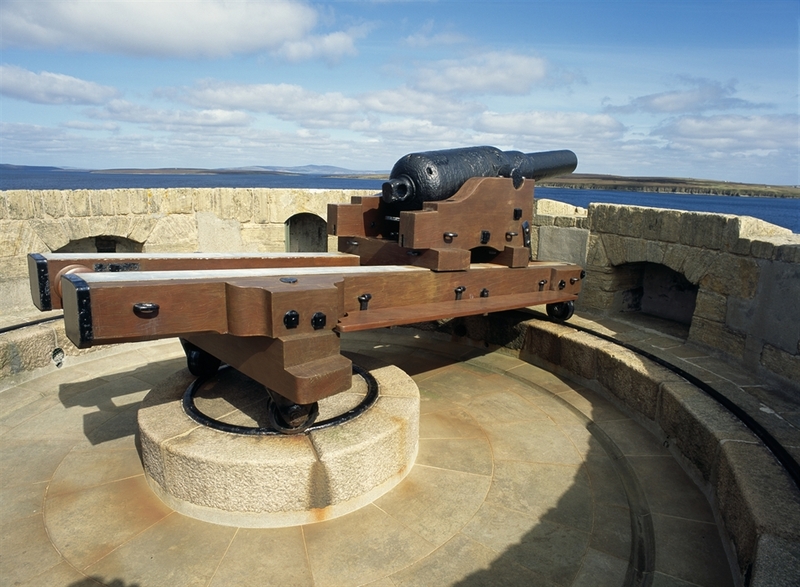 The only record that the guns were ever fired comes in 1892, when a hundred men from the Orkney Volunteer Artillery spent a day there carrying out gun drill and target practice. 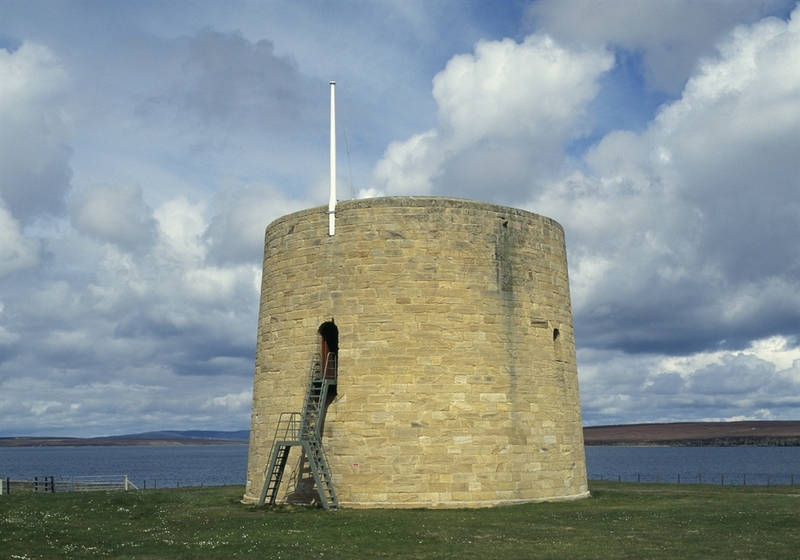 During the two World Wars, the battery and towers were mere bystanders as the remarkable events in Scapa Flow unfolded. The first battery comprised eight 24-pounder cannon firing over a sloping parapet. They were mounted in V-formation on timber traversing carriages so that they could cover the entire width of the sound. Behind them were the soldiers’ barracks and store, and behind them the powder magazine. In 1866, the eight guns were replaced by four new-fangled 68-pounder guns, firing through embrasures. 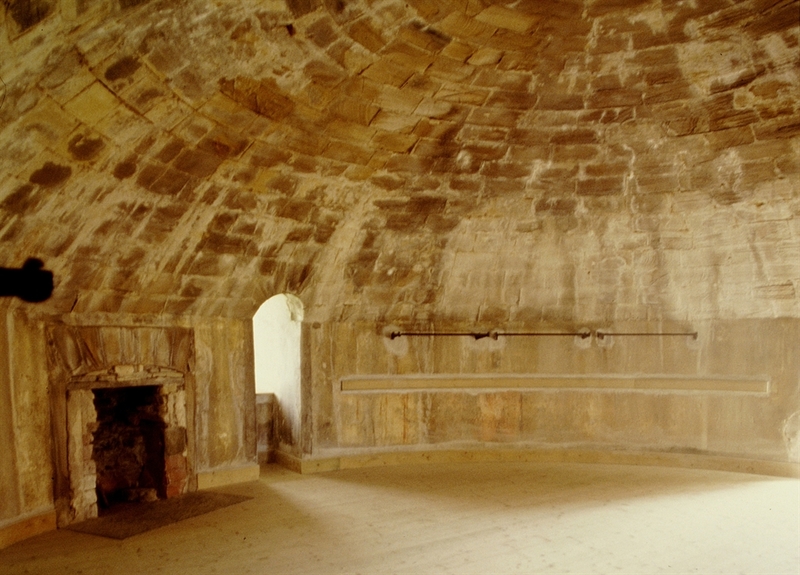 The barracks were remodelled to provide separate quarters for the NCOs and master gunner. Other new buildings included a guard house, cookhouse, ablutions and latrine blocks. Martello towers take their name from Mortella point, on Corsica, where in 1794 two small cannon mounted by the French on a circular masonry tower beat off an attack by two British warships with a combined firepower of 106 guns. It so impressed the British that, when Napoleon threatened to invade in 1803, over 100 similar towers were built along the south coast of England. Hackness and Crockness towers were built a decade later. Aside from a tower guarding the port of Leith, Edinburgh, they were the only ones built in Scotland. Hackness Martello comprised three floors. Like a medieval tower house, the entrance was at first-floor level, reached by a wooden ladder. It led directly into the barrack room. This provided bed-space for 14 men; their NCO slept in a private cubicle. On the floor beneath lay the powder magazine, stores and water cistern. Above them was the gun. The first gun was a 24-pounder, but this was replaced in 1866 by a 68-pounder. The latter was removed around 1900, and the gun now on display is a 64-pounder Armstrong of similar vintage.